We have all survived either our first, or another, set of exams. Congratulations!! I will have a good long purr in everyone's honor. I don't know about you, but I have earned not one, not several, but many, many catnaps. And I will have ample time, over the next 11 days - starting at 11pm Thursday, December 22 - while the Library is closed. We will reopen rested and refreshed on Tuesday, January 3rd at 9am. So, enjoy your break and the holidays and . . .
a Happy New Year to all and to all a GOOD NIGHT ! Today is the Winter Solstice. Here in the Northern Hemisphere that means it is the shortest day of the year, with the least amount of sunlight. But don't fret. With the school semester almost over, each day will start to get longer and longer. You can say there's a light at teh end of the tunnel even. Most of the law school libraries in the New York City metro area have expressed their willingness to let each others' students into their libraries in order to study for exams during the transit strike. Participating institutions include Columbia, CUNY, Hofstra, NY Law School, Pace, Rutgers, St. John's, Touro, and Cardozo. It's that time of year again. All of the "best of" lists and "year in review" stories get published now. Almost every day a new one comes out. If you'd like to go to one website that compiles links to many of these lists and stories on one page and continually updates it as they come out, then see Refdesk.com 2005 Year in Review. A Virtual Library Cat knows that exams can make law students wish for a quick escape to another planet, or at least to a galaxy far, far away. Well, there is a way to clear your mind for a few minutes, and place yourself in a universe without the law at the center of gravity. Try taking a study break with the thematically arranged breathtaking space photos at the National Space Science Data Center Photo Gallery. 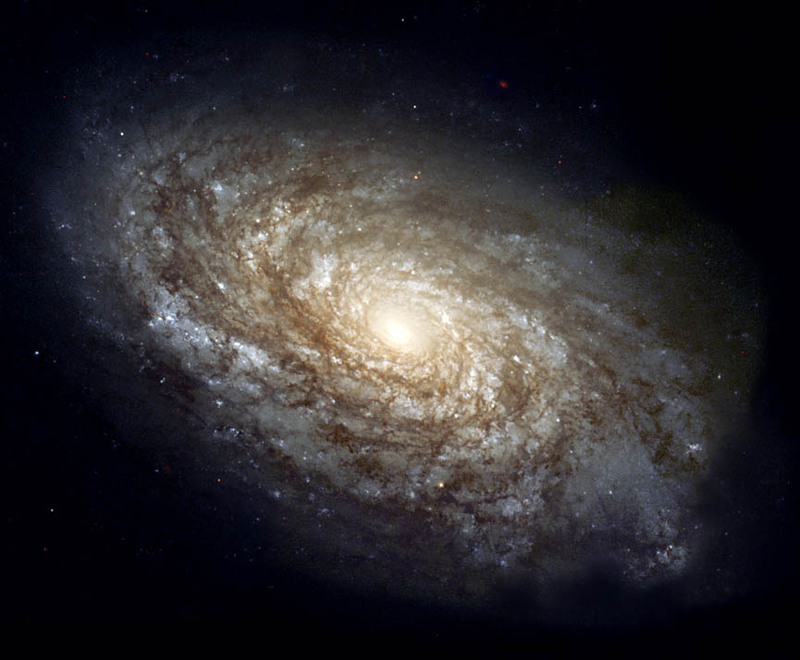 Select from views of the planets, of the earth and moon, and of galaxies and comets, collected from the NASA space missions. This site is worth book marking for return visits throughout the year. As a break from all things law- and exam-related, perhaps you'd like to escape into 17th-Century London for a little while. The famous diary of man-about-town Samuel Pepys (pronounced "peeps") has been cleverly posted in Web log format for your enjoyment. If you have not noticed a puzzle is set out on a table outside the Main Level Computer Lab. Completion of the puzzle is a community effort. Take a few minutes to work on the puzzle whenever you get a chance. It is an easy way to get a quick break and clear your mind of studies for a little while. Monday - Friday: 7 A.M. - 2 A.M.
Saturday & Sunday: 10 A.M. - 2 A.M.
Thursday, December 22 : 7 A.M. - 11 P.M.
Again, good luck on exams! If you are looking for a website that you can use as a portal for almost everything that you do on the web, refdesk.com might be it. Although it is a very busy page, if you are willing to look around you will find some of everything. There are links to search engines, reference resources, news sources, facts sites, help and advice, reference tools, and much more including fun links such as Letterman's Top Ten, Addicting Games.com and Astronomy Picture of the Day. The world of podcast search is exploding! There are a number of search engines which seek to give order to finding podcasts, much the way that services like Technorati have made it possible to locate blog postings. These engines allow users to search podcasts by keyword. For example, Podzinger and blinkx search audio content for keywords by translating the audio into text and creating an index for quick searching. This is really powerful technology. Usually, an audio search engine would just be searching the title and a short descriptive summary of a broadcast. Another innovation can be found at Podscope. This search engines allows users to set up keyword-based RSS feeds and receive alerts when certain words are spoken in a podcast or other types of audio or video programs. Stay tuned... I strongly suspect there will be much more to report as this medium continues to grow. There was more big news from Google this week--the announcement of Google Transit Trip Planner. Designed by a few Google engineers during their “20 percent time” (part of the work week given over to the pursuit of unique and interesting ideas), Google Transit lets commuters and travelers access public transportation schedules and other information for a metropolitan area to instantly plan their best route. Google Transit maps out complete trips for specific days and times, all on one web site. It also provides driving routes, and compares the cost and time spent driving somewhere with that of using public transportation. Although the first release (in beta) covers only Portland, Oregon, Google plans to quickly expand the new product to other cities. Meanwhile, everyone can try it out at www.google.com/transit. Here’s a sample result for a specific date and time. More information about Google Transit is found at the site’s FAQ page. Monday - Friday: 8 A.M. - 2 A.M.
Thursday, December 22: 8 A.M. - 11 P.M.
Federal governments throughout the world publish some type of gazette that documents regular governmental activity. For instance, in the United States, the government publishes the Federal Register. The Government Gazettes Online Web site Aattempts to list all online government gazettes and their characteristics to aid researchers. @ The site contains entries for each gazette, which is organized alphabetically by country name. Each entry provides the gazette's title, URL, and other information. As you know, drinks are allowed in the Library in pretty much any type of container. We do ask though that if you do have a spill, please either try to mop it up or let us know at the Circulation Desk. In which case we will try to clean or, depending on the spill, get a maintenance worker over to clean it up. Thanks, and good luck on those finals! Just a few observations I've made over the years on studying for law school exams. There is no right or wrong way to study. Everybody studies differently and should do whatever works for them. Most professors have given or will give their students a pretty good idea of what they expect from an exam answer. Drink plenty of water and get a good nights sleep. Eat properly and make time for exercise. It is OK to take a time out to clear the mind and relax a little. In the past the library has put out puzzles and games to help students take a break. If you are having difficulty understanding a concept, term, etc. in one of your classes, ask someone. You may be part of a study group or ask in class (while you can) or reference librarians who know how to find answers. It is easy to stress out during the exam period, so take a deep breathe and let it out slowly. Do this several times. None of this is really new, but sometimes it helps to be reminded. The White House website has a page in which you can find Presidential news, press briefings, proclamations, executive orders and radio addresses. The page is in the form of a blog, with listings for each day. The listings are in the forms of links which you can click to read the full news story or hear the full radio address, etc. There are even RSS feeds for Presidential news and speeches, White House press briefings and Presidential Weekly Radio Addresses. The federal circuit courts of appeals sites were ranked at the bottom of the 61 sites evaluated. .
Everyone is concerned about getting the best bargains when gift shopping. But getting good value for your charitable donation dollar is just as important—for you and for the people or special causes you want to help. The BBB Wise Giving Alliance, a nonprofit organization formed from the merger of the National Charities Information Bureau and the Council of Better Business Bureaus’ Foundation and its Philanthropic Advisory Service, offers free online "Charity Reports" on hundreds of charitable organizations that solicit nationally or have national or international programs. Charities are selected based upon the volume of donor inquiries. They are evaluated using accountability standards for how they are run, how they advertise and disclose information to the public, and how they spend their money. Another great web site is maintained by Charity Navigator. This independent nonprofit evaluator provides free objective analysis and ratings of 5,000 of America’s largest charities (classified into groups such as environment, arts, animals, and human services), utilizing financial data that the charities are required to provide to the federal government. The Library now subscribes to all of the online BNA publications. BNA has many useful titles - from Supreme Court Today - where you can find out what's happening at the U.S. Supreme Court every day, to many subject specialty publications, such as Family Law Reporter, C0rporate Practice Library, Health Care Daily Report, etc... These resources are great for in depth research on a topic, for finding what are the latest issues in an area or even for finding interesting paper topics. To see a subject listing and links, go to the Library's Research Databases page and click on BNA. You can also go directly to www.bna.com and click on the Subscriber Access menu. For access from outside of Hofstra, contact your favorite Reference librarian for the username and password. The increasing proportion of the population that is middle-aged or older has led to many challenges and changes, some proposed, some enacted, in law and policy. For those who wish to keep abreast of this cutting-edge area of the law, the Boston law firm Margolis & Associates offers a Web page, Elder Law Answers, that provides a starting point. While it's unusual for an oral argument to be posted so quickly after it's heard, today's argument on Ayotte v. Planned Parenthood of Northern New England can be found here. For those of you doing more Supreme Court oral argument research, remember that there are any number of publicly available sources available including Oyez (audio), Official U.S. Supreme Court site (transcripts), and the Curiae project (briefs). Lexis and Westlaw databases can also provide a wealth of information about the Supreme Court. We read or hear that a bill has been introduced in the House or Senate but may be unsure about what the introduction of the bill means. Is it law? (No) Is it important? (depends). In the 108th Congress (2002-2004) 8,621 bills were introduced, 498 were enacted into law (from article). Lawyers do need knowledge of bills and the legislative process. This article "A Bill in Congress" is a brief discussion that provides information that you probably did not hear in a Civics class. It also links to an article on Amendments that from a "how things work" point of view may be more important. By popular request, there is now an electronic stapler at the circulation desk. Since staplers (electronic and otherwise) seem to be rather fragile and endangered instruments in the library environment, we ask that you treat them kindly. Should the electric stapler meet an even more untimely end than our regular staplers, it will not be replaced and we will revert completely to manual staplers. With finals almost underway, this seems to be an appropriate time to take a look at this classic article "Thirteen Rules for Taking Law Exams" by Jerry J. Phillips, reprinted at 72 Tenn. L. Rev. 797-806 (2005). Originally published in the Journal of Legal Education in 1971, it is a funny, sarcastic list of what (not) to do while taking law exams. You can find this article in both Lexis and Westlaw and a paper copy of the journal in our library. If you want both good advice and a chuckle, this is the place to go. Another crown jewel available on the free web is Bartleby.com. Bartleby.com offers a breathtaking collection of literary and reference works, encompassing everything from quotation compendiums to poetry and short stories. It's divided into four main sections - Reference, Verse, Fiction and Nonfiction. The reference collection is one of the best to be found. Bartleby.com Has an extremely clear search interface. By means of drop-down menus you can choose whether to search the whole site, each of the four major categories, or each of the individual works. Extensive, elegant, easy to use and extremely authoritative. What more could you want in one spot? December is almost here, and that means exams (sorry!) are almost upon us. Most students rely on outlines and study guides, and on reviewing past exams, among other strategies. But there’s another resource that shouldn’t be overlooked. CALI (the Center for Computer-Assisted Legal Instruction) has a web site full of interactive computer-based lessons keyed to typical law school courses and texts (both 1L and advanced), prepared by law faculty from across the country. For example, let’s say that you think you understand most of a course, but there is an important topic or concept covered in class that you don’t really feel confident about. Chances are that you will find a CALI lesson on the topic—such as consideration, hearsay, diversity jurisdiction, or adverse possession—that will provide some clarity and review. Check out the CALI welcome page, where you can search for “Lessons” by subject, textbook, or course outline to find the best one for your needs. Hofstra is a CALI member organization, but you will need to register online with a special password (Law School Authorization Code) the first time that you use CALI lessons. Contact the Law Library Reference Desk to obtain this password from a reference librarian. The first floor lab is closed at the current time. The computers are being fixed to hopefully solved the printing problem that has occurred recently. Despite a late start due to a problem with the install, the lab should still be done by noon at which time it will re-open. And have a good Thanksgiving Break! There are some changes to our regular library hours this week so that everybody can enjoy the Thanksgiving holiday. We will be closing at 5:00 p.m. on Wednesday and will be closed all day on Thursday and Friday. (Though the library is closed on Friday, the rest of the law school building will be accessible through the card swipe entrance.) We will be back to our regular weekend hours this Saturday and Sunday. If you are ever unsure about any of our hours they are posted on our website and on boards both in and outside the library. Our next change in hours will be for finals studying beginning 12/9. Changes adopted as of today, November 21, 2005 : Keyless reservations and passes. Over the last few years, the locked study rooms have caused a variety of problems, not only for the library but also to other users. Keys have been lost, misplaced, or returned days later. Sensitive or confidential information has been left in locked rooms long after the reservation for the room has expired, creating anxiety on the part of new users as well as an unwarranted expectation of privacy by the current keyholders. These are only some of the problems that have been encountered and which can be solved by keyless reservation. A keyless reservation system will also be necessary for the electronic study room reservation system we eventually hope to adopt. Issuing passes will serve two functions. First, it will confirm to the requestor his/her reservation time, date and room. Second, in the case of a room dispute, it serves as clear authority for the priority of use. Both of these measures are intended to improve the overall study room experience, though we realize that they will affect some side benefits. Users will no longer be able to lock their materials as they go to make photocopies or check out a wireless card. However, considering that these new procedures more effectively facilitate the assignment of study rooms for their primary purpose --- to provide a place where groups (ideally) can study without disturbing other patrons --- the change seems necessary. As always, please feel free to leave comments! 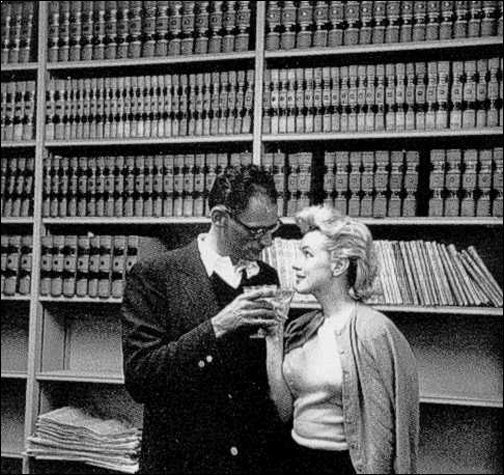 Marilyn Monroe said, "I love libraries. You meet the nicest people in libraries." (She is pictured here with her then husband playwright Arthur Miller). Marilyn's words still hold true. Remember that the librarians at the reference desk all have law degrees. We know what this time of year is like for you- we have all been there. Please don't forget that we are here to help in any way we can (short of pouring martinis in the stacks)! Your Virtual Library Cat hasn’t forgotten what holiday is coming up. So it’s time for a little Thanksgiving fun and information. Compliments of the most authoritative source--the folks at Plimoth Plantation, the living history museum of the Plymouth colony—explore an authentic “First Thanksgiving” online. The museum web site’s interactive multi-media production, “You are the Historian: Investigating the First Thanksgiving” offers some fun learning for the whole family. Don’t miss the focus on food, including authentic seventeenth-century recipes. While I am in a number-crunching mode, if you need to get some statistical data on other topics, there are many good sources - both for the entire country and localities. FedStats , a great place to start, gives you an overview of the Federal statistical websites available. For more detailed information, try census.gov , which will give you details about housing, trade, population and even a U.S. Population clock. For more local statistics, go to the American Community Survey, where you can find details about the counties throughout the country, including Nassau . Need some statistics regarding crime and victims, law enforcement, the federal justice system, or courts and sentencing? If so, then the Bureau of Justice statistics Web page should be one of your first online stops. As many of you are aware, there is a problem with printing in the labs in the Law School. This is part of a University-wide problem, and the university computer folk are working on fixing the problem. That's why the lower level lab was closed yesterday, as part of an attempted fix. Yes, I know we have already posted several times on Judge Alito, but I just discovered an interesting report that charts various legal events or matters pertaining to the activities of Judge Alito. Intersting data on the practice areas and industries that have litigated cases before him. West created this Litigation Profile report and posted it on Findlaw.com. For online shopping! In a PC Magazine article reviewing six comparison shopping sites ("Price-Comparison Sites Strive to Save You Time and Money" 11/02/05), PriceGrabber came out on top. The sites reviewed included Become, MySimon, Shopping.com, Smarter.com , and Shopzilla. The Author also includes a look at Buy.com, Amazon.com, and eBay. This is a great guide to not only how to find the best price, but also how to use these comparison sites as a "shopping concierge". Saving both time & money is what shopping on the net is all about. Walking softly on cat feet around the Library computers, I’ve noticed that the use of military tribunals is a hot topic these days, even at the Supreme Court. Would you like some reliable background information on this confusing subject at the intersection of military and constitutional law? Try the “Military Tribunals” page at JURIST, which offers news highlights, links to government and other web sites, and recent primary documents in a user-friendly format. The Council of Foreign Relations answers most frequently asked questions about military tribunals. The Pentagon Library offers a resource guide to the relevant law. For introductory background information and research guidance, a good place to start is "United States Military Commissions: A Quick Guide to Available Resources,"by law librarian Stephen Young. "Terrorism and the Law of War: Trying Terrorists as War Criminals Before Military Commissions," a Congressional Research Service (CRS) report for Congress, provides an objective and authoritative overview of the subject. Per University Card Services, this library can no longer sell copy cards to Hofstra students at the circulation desk. All Hofstra students should add money to their Hofstra ID and use the ID for copying. You can add value to your card by (a) using the Card Services machine in the library's lower level copier room or (b) going to My Portal, Selecting the Hofstra Online Tab, and adding value under Card ServicesMake Deposit. As end of the semester madness begins to set in, more and more students are seeking quiet study areas. As this is a working library (with faculty and staff offices), we know that even the designated "quiet" areas are not (and cannot be) entirely quiet. Therefore, we just want to remind all users that there are still three areas of the law library that are not ringed by offices, and therefore, should be quieter than most. After assessing trends in the use of the library study rooms, the library has modified the existing policy to better match use. Effective Monday, November 14, 2005, the policies regarding use of the library's study rooms will be as follows. Study rooms are only available for use by currently enrolled Hofstra Law School students. Reservations for study rooms may be made in person at the Circulation Desk, where a sign-up book is available, or by phone at x3-5898. Rooms may be reserved in advance for one three-hour time period per day, with no renewals. Only one room reservation (per group or individual) is permitted each day. Each reservation will be for a maximum of three hours, with no renewals permitted. In a group reservation, all members of the group must be currently enrolled Hofstra Law School students, and the names of group members should be listed when the reservation is made. At the reserved time, groups are to pick up the key to the group study room at the Circulation Desk. The study room key will be charged to one of the members of the group. The key must be returned at the end of the loan period to the Circulation Desk. If a study room key is not picked up within 15 minutes from the start of the reserved time, the room may be given to another group or student upon request. Anyone leaving any items in a study room beyond the reserved time will have these items put aside in the room, and the group or student having reserved the room will be let into the room. The Library takes no responsibility for any items left in a study room. 1. Food is not permitted anywhere in the Law Library, including the study rooms. 2. Please cancel your reservation if you find you no longer need it. 3. When leaving the room, please turn off the light and close the door. 4. Study rooms are to be left neat and clean when the group is finished. Any library materials used in the study rooms must be reshelved. 5. Abuse of study room privileges may result in the loss of the use of the study rooms. If you have any questions about this policy, please contact Dominick Grillo, Assistant Director for Technology and Collection Services (lawdjg@hofstra.edu). The Reference Librarian I am currently purring next to has just had two questions about finding journal articles on HeinOnline. HeinOnline is available from the Law Library's Research Databases page. It provides full-text of many law review articles in .pdf format and, for many journals, covers much earlier dates than either Lexis or Westlaw. Try it out. Another repeat of something I have mentioned before - THIS IS A BLOG!!! This means you get to post your thoughts or questions. If you have suggestions for the Library, comments on events or just want to tap in to the Law School community post a comment. I am getting kind of lonely here. private archive and library of its kind. It contains hundreds of thousands of pages of government records, the release of many of which has been long awaited. The "AARC Public Library" offers visitors reports, transcripts, and documents relating to political assassination that are accessible via browsing or searching. I hope you all not only remembered to vote, but did in fact vote. Besides the local elections here in Nassau, there's lots of other election/voting news. For NYC, Bloomberg was re-elected. In NJ, a new governor was picked. In England, PM Tony Blair lost a parliamentary vote. And in Egypt, the first of three stages of voting occured. Today is an Election Day. Have you voted? Remember that the New York polls are open until 9 PM. Local elections are important too. Vote! The Law Library Association of Greater New York (LLAGNY) has a page on their web site devoted to New York Legal Research. There are links to primary material such as the state Constitution, legislative material, legal opinions and court rules. There are also many other links of both secondary legal information and some non-legal information that could be of interest to a New York legal researcher. You can find links to New York's Education department, Worker's Compensation Board, Court System and State Library among the many links on the page. The Federal Bureau of Investigation's Freedom of Information Act (FOIA) webpage has a most engaging section. The Electronic Reading Room has electronic files compiled by the bureau that have been released via Freedom of Information Act requests. These files can be browsed alphabetically, or via categories such as "famous persons", "historical interest" or "violent crime". Take a look. The National Enquirer has got nothing on the Feds! You already know how to find scholarly articles on legal topics to help you in writing your research papers, but how about scholarly articles on non-legal topics? While there is lots to choose from, one great source is Academic Search Premier . This is a general interest database, so you will find articles on many different subjects. Unlike Lexis and Westlaw, you will be searching an index, rather than full text, so you want to use broader subjects for your search terms. (You are searching just title and subject descriptors, rather than the entire article.) Many of the results do provide access to the full text of the article. The Electronic Code of Federal Regulations ("E-CFR") is the prototype of a currently updated online version of the Code of Federal Regulations ("CFR"), with the rapid updating capabilities that that fact implies. While the E-CFR is not yet an official legal version of the CFR, it holds great potential for the future, and is an excellent place to start when you want a quick way to check the latest version of a regulation.